Welcome to ‘Taumata’, a three bedroom holiday home with beautiful views over Hot Water Beach in New Zealand’s stunning Coromandel Peninsula. You are moments from the beach, which is only 50 metres walk away. Hot Water Beach has been named as one of the top ten beaches in the world, and makes a perfect holiday spot. It is located on the east coast of the Coromandel Peninsula, between Tairua and Hahei Beach, around 2 hours drive from Auckland or Hamilton. Hot Water Beach is unique as hot springs flow to the surface of the beach at low tide, meaning you can relax in your own thermal hot pool which you literally dig out of the sand. We provide a free set of shovels and spades to dig your pool. Hot Water Beach is great for fishing, surfing, beach and bush walks, kayaking, bird-watching. Plus the lagoons at either end of the beach are ideal for kids to swim and fish in. Nearby are Hahei Beach and the picture-perfect Cathedral Cove both are only a 10-15 minute drive away, with Cooks Beach, Flaxmill Bay and Ferry Landing only 15-20 minutes away (where you can enjoy a short ferry ride across to Whitianga and Mercury Bay). 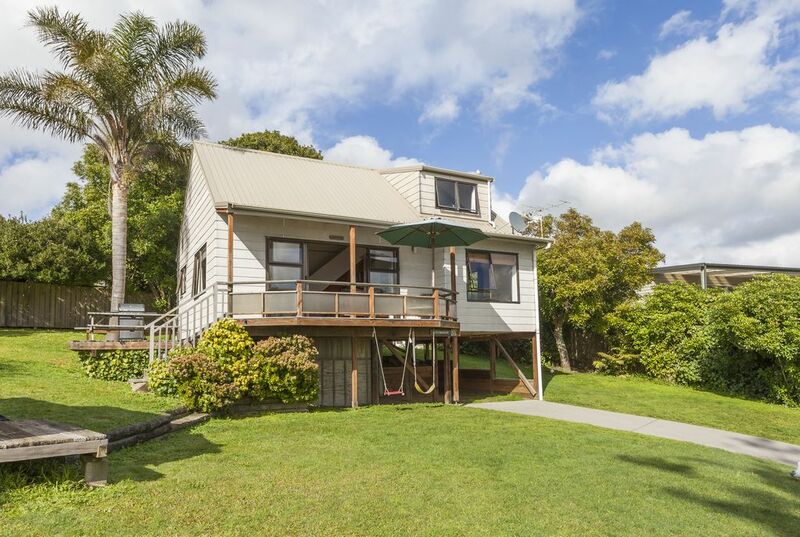 Taumata is one of very few homes at Hot Water Beach, and is available to rent on a long or short term basis to careful and responsible families and mature groups. We are constantly upgrading Taumata, and we now feature a new concrete driveway up to the house. A two night minimum stay applies (sorry, no exceptions). 5 day minimum bookings preferred during peak holiday periods, but contact us with your request and we'll see if we can fit you in. Rates are for up to 4 people + a surcharge of $20pp per night applies for further guests. Arrival after 3pm, departure by 10.30am please. Loved the spot , loved the house . Thank you so much for your positive comments about your stay at our bach. thank you also for looking after our property so well. Beach. We thank you for looking after everything, and we hope you will stay again. Sincerely, Carol& Lane. .
A lovely house with a stunning view over the ocean. We really enjoyed our three night break there. A very well equipped place. Just a shame the surf wasn't good whilst there but hope to come back again in winter. Thank you. Thank you for your kind comments on your stay at our bach at Hot Water Beach. Thank you also for looking after it so well. We hope you will return and that the surf is more accomodating! Cheers. Loved our stay, although we had quite a few admin issues with communication sometimes through the app sometimes via email it was so worth it. The Bach was easy, pleasant, and a true delight. Thank you so much for the review of your stay at our bach. We are so glad you enjoyed your time there.We have never had guests have the problems you experienced with the booking process. Good on you for persevering!! Sincerely, Carol. We hope you return some other time- you would be so welcome!! Nice holiday home with a view over the bay and just a few hundred meters from the beach. We spent two nights here, it had all we required for the time we were there.